In one of his books, Philip Yancey quoted a speech delivered to the Royal Society of Medicine by a British psychologist. It said, "The spirit of self-sacrifice which permeates Christianity, and is so highly prized in the Christian religious life, is masochism …" And then he went on to say that Jesus was even more imbalanced and masochistic. I'm sure he would say the same about the sacrifices of Paul. He would not see Paul as balanced. I beg to differ. Paul was driven, I do not deny that, but he was driven by an eternal perspective that gave him balance because it enabled him to understand what was important. He was driven by the power of God, and so was empowered to do God's will. He was driven by relationships. He was driven by the truth of God's Word. But he knew how to relate to all of those things by God's grace. Paul knew how to relax and he knew how to sacrificially work. But how do we know what is the balance between those two? I suspect that some of us might have thought that Jesus was imbalanced if we were one of the disciples walking with Him day by day. One time he was so exhausted from his work that he was sleeping in the boat during a storm and the waves were washing over him, and He didn't wake up. He must have been extremely exhausted. Is that a balanced life? Yet Jesus spoke to His disciples of the imperative of rest. He often took his disciples aside for a time to get rested and refreshed. He had his times alone. But I tell you, finding balance in our labors can sometimes be a struggle. There will always be far more work available than we will ever have time to finish. In fact, I am convinced that Satan sometimes throws ministry opportunities at us to keep us from doing what God intended. So choices always need to be made. Jesus didn't take every ministry opportunity that presented itself. We will see today that neither did Paul. But the same is true of leisure. There will always be far more leisure opportunities available than there will be money and time to finish. And I'm sure that we still won't have the full answer to this question even by the time this sermon is done. It takes a close walk with God to know when to stay up all night praying (as Jesus did on occasion) and when to relax. God sometimes calls us to do things that may seem imbalanced to the world. So when I speak of a balanced life, I am speaking of a life that is governed by the Scripture and is sensitive to God's leading. I'm not saying, "Look to the world, or even your own opinions for what is balanced." This has got to be a God-centered thing. Let's begin with the first phrase in verse 18. "So Paul still remained a good while." The implication is that because of the circumstances in the previous verses, Paul still remained a good while. We have three circumstances that would warrant it: 1) First, God clearly led him to stay in the city in verses 9-10. 2) Second, God protected him so that he wasn't run out of town or imprisoned by Gallio. So providence was making it possible. That's an aspect of guidance as well. 3) Third, the vow that Paul made (and has apparently finished when he cuts off his hair), indicates that Paul is finished with his commitment. And I think those three types of guidance continue to determine whether we are balanced or imbalanced. There are times when we really want to move on like Paul wanted to in verses 9-10, but God does not let us. We would love to take a vacation, but God does not let us. Jesus was in that circumstance on at least one occasion. He wanted to take His disciples away for a rest, and the crowds found him. And the disciples were so disappointed, but Jesus knew that it is God's will for Him to stay and minister, even though He was tired. Who teaches you to profit… but He does so by way of guidance. I have seen Christian businessmen who are just like Joseph. It's clear that God is with them. It isn't just hard work. God is bringing things together so that their business takes off with the hard work. He teaches them to profit. If you have neglected to study God's guidance you are missing a key ingredient in gaining balance in life. Drivenness will only take you so far. You need it to be balanced with family, fun, ministry and other things in the mix that God dictates. And it is God alone who can help you to discern which things to leave behind because you will just be spinning your wheels, and which things to take on. The second side of that guidance is providence. Any time Providence opens up opportunities you need to at least evaluate them. Verse 17 afforded an unbelievable open door for Paul, and he just didn't feel like he could let it go. Of course, later on in verse 20 Paul has an unbelievable opportunity, and he turns it down, so opportunity alone is not sufficient. But it is a great means of God's guidance. Businessmen sometimes have to jump on an opportunity when it's not convenient. And more timid people might lose out. Taking this opportunity might mean a lot of lost sleep, but it will pay off and show balance in the long run. We had this happen in one country. Police presence made us cancel our one engagement, but it opened an opportunity to minister to a huge movement we would not otherwise have met. We were dog tired, but as soon as we saw the opportunity, we knew we had to take it. It meant that we lost a lot of sleep, but it was worth it. We can't legalistically think of our schedule as the only factor for decision making when God opens new doors wide open. We've got to be flexible. In fact, flexibility is one of the chief requirements of success. So being sensitive to God's inner guidance and sensitive to God's providence need to be kept together. Thirdly, we have responsibilities and commitments that we need to keep. When verse 18 says, "He had his hair cut off at Cenchrea, for he had taken a vow," it is clear that Paul was following Jewish custom for the beginning and ending of such an important vow. He kept his commitments, and letting his hair grow until it was finished was a sign to others of how seriously he took this issue. Psalm 15:4 describes a righteous man as one who swears to his own hurt and he does not change. Even though he will lose money by keeping his word, he keeps. Even though he will lose a business opportunity, or lose sleep by keeping his word, he keeps it. If you can keep those three things in mind, it will help you to not be frustrated when life seems imbalanced. God must always have the right to bluepencil in our plans, and when He does so, it is balanced whether it feels like it or not. And more importantly, it will be prospered. Point number I is a most important point. Let's move on to point II – diligence in labors. There is no balance when we do not have diligence. There is no balance when we have not developed a Protestant work ethic. Paul had a Protestant work ethic before there were any Protestants. Verse 18 says that Paul remained there a good while, and verses 9-11 imply that it was for working. But 1 and 2 Corinthians make this abundantly clear. Those two books say that he labored diligently in Corinth. 1 Corinthians 4:12 says, "And we labor, working with our hands." Paul was not afraid of dirty work even though he was an apostle. In fact, one of the reasons Paul was so successful was because he had a philosophy that hard work never hurt anyone. Comparing himself to some other laborers, Paul said "I labored more abundantly than they all" (1 Cor. 15:10). He was a hard worker. There wasn't going to be anybody that was going to outwork him. He poured his all into what he did. And when writing to the Thessalonians right around this time, he chewed them out for their laziness, insisting that they must develop a Protestant work ethic. In fact, if you've got lazy kids, work them through 1 and 2 Thessalonians. That's the place to go for the Protestant work ethic. He went so far as to tell them, "For even when we were with you, we commanded you this: If anyone will not work, neither shall he eat." That's pretty serious! No work ethic? No food. Work was important to Paul. God invented it in the Garden of Eden, and it was not part of the curse. It came before the curse and it is also what is necessary to overcome some of the effects of the curse. But work itself was blessed by God. In 2 Corinthians 12:23 he said, "Are they ministers of Christ?—I speak as a fool—I am more: in labors more abundant." Paul was definitely a hard worker. Proverbs 12:24 says, "The hand of the diligent will rule, but the lazy man will be put to forced labor." The interesting thing about that Proverb is that both the diligent and the lazy man have to work, but one man's work leads to progress and dominion and being in charge, while the other man's work is the opposite - dominion is being taken of him and he has to be forced to work. In fact, some lazy people have to work hard looking like they are working. When I was a janitor in the hospital, one of the employees did virtually nothing. But what was amazing was that he always looked busy. And the joke was that he worked far harder to avoid work than he would have if he had actually done the work. There was a sign in a San Francisco florist shop that said, "If you don't believe in the resurrection of the dead, you ought to be here five minutes before quitting time!" Apparently a lot of lazy people there. It is my prayer that this could never be said of you. Laziness is a horrible testimony. We need to teach our children the Protestant work ethic. Without it they are leading an imbalanced life. Part of the problem is that we allow society to dictate what is too much. Apparently the average American works a 40 hour work week followed each day with a few hours of television. And that's his routine. You work, you watch TV, you eat and you go to bed. And if you are particularly energetic, you go out to a ball game. European countries have adopted a 35 hour work week. A week ago this past Tuesday, the New York Times interviewed a French lady who thinks she is worked way, way too hard. She works 35 hours a week, and gets 58 paid vacation days (that's not counting these long weekends). That's 58 paid vacation days. But she thinks that she's working too hard. She'll never get anywhere, even if she marries a rich man and gets to be lazy at home. And so this morning I urge to look at the apostle Paul. He is going to take a vacation, but it is not because he hates work. He values work. He's building a heritage. Two weeks ago we saw that he was indeed overworked for a very short period of time. He said that when he started his ministry in this city he was full of weakness and trembling. But he quickly resolved that bad situation by getting outside support, dropping one of his two jobs, division of labor and pacing himself. But I believe that he was able to thoroughly enjoy his furlough (coming up in a few weeks) because he had poured his all into dominion. But if all you know is work, then you are not balanced. The Corinthian church seemed to have no sense of shame over the fact that they made Paul work at tent-making in order to have the money to be able to work hard for them. And they didn't pay him. In 2 Corinthians 11:8 Paul said that this was robbery. They were like the churches that believe it is their duty to keep missionaries humble by keeping them poor and overworked. So Paul complained, "…is it only Barnabas and I who have no right to refrain from working?" (1 Cor. 9:6). Paul was saying, "That's not right. And he taught the churches about the importance of rest. Let's take a look at Paul's plans to take a vacation in this chapter, because if we don't plan for rest, it may not happen. It certainly doesn't happen around our joint unless you plan for it. And that is what is implied in verse 18. "Then he took leave of the brethren and sailed for Syria." Syria is where he had started from three years before, and if you look at the last place he ends up at in verse 22, you will see that it says, "he went down to Antioch." Antioch was his home base in Syria. So his second missionary journey was three years, and now Paul is planning a furlough. He's planning a break from missions; a time of recuperation and rest before he begins his third missionary journey. But before he will be able to do that, everything has to be smoothly running. So Paul leaves Silas in charge in Corinth. He will take care of church affairs there. Paul makes some last minute preparations in Cenchrea, which is the port town near Corinth. He will also leave Priscilla and Aquila in Ephesus. Verse 18 says, "and Priscilla and Aquila were with him." Verse 19 says, "And he came to Ephesus, and left them there." We're not told what tasks he gave to Timothy or Titus, but it is clear that they are a big part of making this all work. So he has to plan for his furlough. He doesn't just bail out on his responsibilities. Sometimes it's hard work to take a vacation, and make it a meaningful vacation. There are so many preparations. That's why vacations don't appeal to some people. It takes hard work to prepare for them and it takes hard work to catch up on your work after you have been gone for some time. But we will see in a moment that those vacations are important anyway. From the map you will see that Paul doesn't make a lot of stops. He's in a hurry to make it for the Passover conference. But he does just enough planning so that he can really enjoy his furlough. You will see from the map that even though verse 18 says that he set sail for Syria, he's got two stops to make before he gets there. And these are critical to his next missionary journey. And we've already mentioned his vow. Apparently this was similar to a Nazarite vow, which to me shows that Paul had no shame in continuing to be a Jew. Commentaries aren't quite sure what it is about, but it appears that it is part of the affairs that Paul has to wrap up by way of planning. Unless we plan for the breaks in life, and unless we take dominion of our time, life will go on and take dominion over us. The best breaks don't just happen. They are carefully planned. A fourth thing that gave Paul balance was that he was willing to share the load with others. He wasn't one of these super-saints who feels like "it is all up to me." Some people can't relinquish work, or when they do receive help, they immediately take on more of a load. It's hard to help such people. But Paul calls Priscilla and Aquila "my fellow workers in Christ Jesus" (Rom. 16:3) And what is interesting about that is that they were not ordained; they weren't even part of his pastoral team. They were just Christians who loved the Lord and wanted to help out in any way that they could. Aquila was a businessman who traveled quite a bit. From the little evidence that we have it appears that he had businesses established in Rome, Corinth and Ephesus – all big cities. It appears that they both loved to be engaged in hospitality, helped Paul out financially, and even hosted a church in their home. They did all that as Christian lay people. In fact, we will see next week that they even instructed Apollos more perfectly in the Scriptures on some things that he had messed up on. So when I say that Paul was willing to share the load, I don't just mean that he had help from people like Timothy, Titus and Silas. He was willing to involve any Christian, and be helped by any Christian. He saw Christ's mission as a mission for all believers. This attitude enables Paul to take vacations without losing his vision. Part of what energizes people is having vision. If you don't share the load, you've either got to stop having the vision or never stop working. But it's not the vision that fatigues. It's an unwillingness to share the load. In fact, Nicolas Boileau said, "He is most fatigued who knows not what to do." Vision is not fatiguing. It is energizing. Even though Paul is headed to a vacation, what's he thinking about? He's thinking about what can be done in Ephesus and Rome, and he's making plans for those places. His vacation is not a dropping of vision, but a necessary ingredient in his vision. From the book of Romans it appears that Paul had been planning to come to Rome for a long time. His joint ministry with Priscilla and Aquila had given him a longing to go there. It was through Aquilla and Priscilla that Paul was likely introduced to Rome and Ephesus. Verse 19 says, "And he came to Ephesus, and left them there;" [in other words, this was their business destination. The text says,] "but he himself entered the synagogue and reasoned with the Jews." The only thing I want you to notice here is that Paul loved to preach. He is still energized by his vision. The vacation is simply a means of making his vision come to pass. We need to rest our bodies from our labors, but our vision or calling will still make us joyful and energized. It's who we are even when we are on vacation. Now, I bring that up because it puts the next point in such stark relief. People who are driven by vision often don't take vacation. Their calling drives them so much that they can't quit work. Well, that's not Paul. Though he has an open door (vv. 19-20a) he lets someone else take it (v. 20b). Priscilla and Aquila prepare the way. He loves to preach, but look at verse 20: "When they asked him to stay a longer time with them, he did not consent." "Wow! Here is an open door; a fantastic opportunity. If I skip my vacation I can plant another church, and this one looks very promising. They are actually eager to know the truth." Any preacher is going to have fun with that. But Paul refuses to stick around. He knows that the world will not fall apart if he doesn't stay. He lets Priscilla and Aquila handle things. Now what is remarkable about that is that they aren't even church planters. They are business people who have to do a lot of traveling. And yet, Paul leaves it in their hands. And sure enough, when he comes back to Ephesus he finds a church meeting with Aquila and Priscilla, but being pastored by Apollos. Where did he come from? Well, we'll look at that next week, but God sent him. It illustrates that life won't fall apart when we are willing to share the load. An over-heightened sense of responsibility can be a curse. There are many women who cannot relax with their husbands because they've got boatloads more work to do. Let me tell you a secret: your work will never end. Let me tell you another secret: If you think that you are indispensible, you are probably not leading a balanced life. Paul has learned in city after city after he has been run out of town, that he was not indispensible. Life continued to function. The churches did not die. God raised up new leaders. Some of the pastors in Asia have had to learn this principle. They only sleep four hours a night and work the rest of the time. They feel guilty if they have a couple days off in two or three months with their families. And we have reminded them that when previous pastors were thrown into jail they weren't indispensible. In fact, one pastor said that his jail terms proved to be God forcing him to take a vacation and spend more time with Him. But in any case, God raised up new pastors when other pastors were thrown in prison. Paul could do this because he saw every person in the church as his fellow worker. He not only calls Titus and other ministers fellow workers (2 Cor. 8:23), but he called all the believers fellow workers. In 2 Corinthians 1:24 Paul said, "Not that we have dominion over your faith, but are fellow workers for your joy; for by faith you stand." I probably don't need to mention that Paul didn't bail on his responsibilities without finding replacements. He didn't jump ship without giving notice. He planned and helped provide. But he did take time off and let others share the burden. This shows balance. If you never take vacation because of your boss's expectations, think about this. If you never take time off because of your children, you need to think about this. If you never have time for your wife or your husband, think about this. But then we get to the heart of this section – Paul's visit to Jerusalem and Antioch. The first phase of the furlough was taken in Jerusalem. So that's where he is heading in verse 21. Verse 21 says, "but took leave of them…" That's sometimes a hard thing to do. Finding balance sometimes means leaving for a time. It sometimes means saying, "Here's your hat and what's your hurry" (making somebody else leave). These Ephesians were putting pressure on Paul to stay. But Paul lived in light of heaven's expectations, and thankfully he had taken a vow to take this furlough. So he took leave of them. Some of you mothers need to take leave of your kids for five or ten minutes so that you can have quality time with your husbands. And your kids will fuss that this is an emergency, but it rarely is. He took leave of them. That's an essential step. "…saying, "I must by all means keep this coming feast in Jerusalem…" This shows the priority that Paul makes of taking this vacation. That language makes it sound like this feast was pretty important to him. "I must by all means make this feast." He's going to do everything possible to keep it. But let's look at the feasts themselves. What were these feasts? The seven Jewish festivals were sort of like a mixture of John Piper conferences for four to six hours a day mixed together with the kind of feasting you get on a Hawaiian cruise for the rest of the day and evening. Well, that may be a little bit of an exaggeration, but Nehemiah 8 makes clear that the people sat in front of a theological fire hose just like at the Piper conference for six hours, and then they went out to have food and fun. It was an incredibly refreshing conference atmosphere. And I highly recommend that you go to something like that if you can afford it. And for some people that is a big "if." So let me take a little detour here and explain how it was that most Israelites were able to come to these feast days. It could be quite costly to travel several hundred miles. Some (like Priscilla and Aquila) could not always make it to every feast because of business responsibilities, but they tried to do so to at least some of the feasts. One of the three tithes was designed to provide money to be able to go to these conferences and to help others who could not. Let me explain the three tithes that they had. James Graveling convinced me that these three tithes continue to apply in the New Testament. The first one was paid to the synagogue, the second was paid to yourself and the third tithe (if you could afford it) was gathered for the poor once every three years. So all three tithes when averaged together amounted to a yearly amount of 23.3%. And before you faint, let me quickly go through those. The first tithe was 10% of your increase that went to the local synagogues. Everybody gave that. So who did the synagogue give their tithe to? If everyone is responsible to give 10%, then even the synagogue really should tithe. And they did. Numbers 18:26 says, "Speak thus to the Levites, and say to them: ‘When you take from the children of Israel the tithes which I have given you from them as your inheritance, then you shall offer up a heave offering of it to the LORD, a tenth of the tithe." Nehemiah 10:38 says, "when the Levites receive tithes; and the Levites shall bring up a tenth of the tithes to the house of our God, to the rooms of the storehouse." So the synagogue gave 10% of it's money to pay for national priests and expenses of that centripetal missions effort. We will see that in the New Testament they didn't give to the temple – they gave it to the church-missions efforts. And I have to take a second rabbit trail to explain that one: Israel was called to be a priest to the nations and to lead all nations to the Lord. That's why the temple had a court of the Gentiles. Israel was called to missions. The primary way that they did so was by being a crossroads that most nations had to travel through. Jerusalem was called the center of the world. They were to attract the world like a magnet. Well, that is a centripetal force. It draws the nations in. In the New Testament, God changed the way missions would work from centripetal force to centrifugal force. When you spin something around, it goes out. And so the New Testament missions method is to send out the Gospel to the far reaches of the globe. But both were missions. Just as 10% of the synagogue income was sent to the temple in the Old Testament, at least 10% of a church's income should be sent to missions. So that is all on the first tithe. The people's entire first tithe went to the local synagogue, and the synagogue in turn sent a tenth of their money to the temple to be a priest to the nations. Numbers 18, Nehemiah 10 and other passages describe how that worked. But there is a second tithe (or a second 10%) that a person would pay to himself. This tithe was used to enjoy the Lord on your weekly Sabbath days and to enjoy the Lord in Jerusalem on the other festival days. And it was God's way of blessing His people. He wanted to force the people to take vacations and to enjoy life. Let me give you two sample quotes on this second tithe from Deuteronomy. Where the first tithe was called the Levitical tithe, the second tithe was called the rejoicing tithe. And I think you will see why it is called the rejoicing tithe when I read this: Deuteronomy says, "And you shall spend that money for whatever your heart desires: for oxen or sheep, for wine or similar drink, for whatever your heart desires; you shall eat there before the LORD your God, and you shall rejoice, you and your household." "So you shall rejoice in every good thing which the LORD your God has given to you and your house, you and the Levite and the stranger who is among you." (Deuteronomy 14:26; 26:11). What a wonderful tithe! This is what Paul was doing here. He was spending money from the second tithe to refresh his body and soul and not having a lick of guilt about it. As was the custom, if you could afford it, you would also pay to bring along some other poor people or Levites with you so that they too could enjoy the conference. And Paul probably did that. This would be equivalent to having a savings of 10% of your money to pay for pay for wine and chocolates and steaks on the weekly Sabbath (so you would be spending that on special Sunday groceries) and to pay for travel, hotel, food, fun and conference lectures at a John Piper conference. I think that would be a pretty close parallel to the Old Testament rejoicing tithe. The third tithe (or 10%) was given once every three years, or amounted to a savings of 3.33% every year. This was given to the poor. Obviously the poor didn't give the second and the third tithes, but those three tithes were what every person tried to shoot for. If people would return to the three-tithe system, they would have the ability to go on these refreshing vacations. And people who couldn't afford it, would be helped by brothers and sisters in Christ for at least the odd vacation/conference here and there. God is good. He loves to delight His people. He loves to refresh their bodies. He wants them to have balance. He's given one day a week to refresh your souls, and while the Old Testament feasts are no longer binding, the New Testament should not be seen as less gracious, but more gracious. So Paul says, "I must by all means keep this coming feast in Jerusalem." He was looking forward to it. Verse 21 continues: "But I will return again to you, God willing." And he sailed from Ephesus." Work can usually wait when you are trying to fit in a big event like a vacation. If you absolutely think you can't afford to take the time, ask yourself this: "Is someone really going to die if I take a vacation?" How serious is this emergency counseling? Will someone lose a job or lose a house or have some other catastrophe if I don't take vacation? Most emergencies really aren't emergencies any more critical than these new believers asking for help. Usually it's your own expectations, perfectionism or the expectations of others that are driving you to be a workaholic. Work can usually wait. Paul is turning down a pretty big thing here. But he does it anyway. And finally they get to Jerusalem. Verse 22 says, "And when he had landed at Caesarea, and gone up and greeted the church…" From Caesarea, there's only one place that makes sense for him to go up to, and that is Jerusalem. It's south, but it's up in elevation. And that's why the margin says, "to Jerusalem." And all my commentaries say the same. So he has fellowship with the church of Jerusalem, he enjoys a Passover festival with them, and finds the refreshment that Jews so looked forward to. And keep in mind that this is in the New Testament. The literal Jewish days are no longer binding according to Colossians and Galatians, but the principle of rest and rejuvenation is. It's not enough to dismiss those festivals with the dispensational argument: "O, that is only the Old Testament!" Then why is Paul doing it in Acts? The specific times of month may have passed away, but the principle of rest has not. Verse 22 goes on to say, "he went down to Antioch. After he had spent some time there, he departed…" And that begins his third missionary journey. But he stays quite a while in Antioch. This is his true furlough, and we should not begrudge missionaries furloughs. Modern missionary furloughs are probably a lot less refreshing than Paul's was, because modern missionaries have to travel all over the states to meet all their supporters and to tell them what they have been doing for the last three to five years. It's exhausting. But for Paul, he was able to meet old friends, relax, help with the church on a less stressful schedule, and just get his worn out body recuperated. You don't have balance if you don't have vacations. But balance includes the last point in your outlines – that Paul went back to work again. Paul was going to leave on yet another missionary journey. "After he had spent some time there, he departed and went over the region of Galatia and Phrygia in order, strengthening all the disciples." The principle is that when we get older we retread, but we don't retire. Retirement should be out of our vocabulary, unless it means retiring from one job so that we can engage in other ministry. The priests did retire from their heavy labor at age 50 (Numb. 8:25). But they continued to contribute their wisdom and spiritual labors. Some of the best ministries have begun as people have retired from their regular work and have been freed up to donate time to do something else. But the point here is that Paul is retreaded and raring to go. We won't take the time to look at it, but Paul goes back to Ephesus where he will stay for three full years before moving on to other locations. Ephesus will become one of the remarkably stable churches that Paul planted. 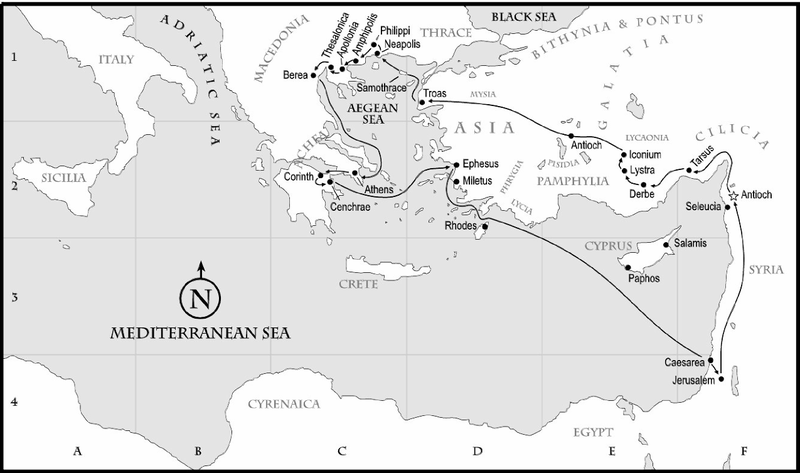 But on the way to Ephesus he travels through the regions where he had planted churches on his first missionary journey. Paul was constantly checking in on, writing letters to, sending other workers to or in some way seeking to make sure that what he started would not fall through. He wanted his ministry to last. And that should be our desire as well – to pass on a legacy to others; to have a lasting impact upon this world. One way to do that is through our children. Another way to do it is through those that we extend hospitality to. Another way to do it is by winning souls. Another way to do it is by helping the pastor, the elders, deacons and other believers in the congregation. But till the day we die we are called by God to a balanced life of labor and refreshment. The pattern that God gave was six days of work and one day of refreshment, and then the generous sprinkling throughout the year of numerous vacation days. There are 52 weekly Sabbaths in a year in which Israel could rejoice, and Israel had an additional 47 feast days. One of the festivals was two weeks long. Another was eight days long. But 47 days altogether. So the Europeans whom everyone mocks for their long vacations, may not be all that far off after all. What is balance in our labors? Who defines it? I think we need to look to Scripture. And balance in part is achieved by seeing the reality of God's presence and leading in our lives as we recognize His voice and we recognize His providence. In part it is being empowered by God for both labor and rest. In part it is relating to the community of saints by the indwelling Spirit of fellowship. In part it is finding weekly and periodic times of refreshment for both body and spirit so that we can once again go out with energy and take dominion. May God's power and presence be with each one of you as you seek to achieve this balance by His grace. Amen. Children of God, I charge you to labor and have fun; labor by God's grace and be refreshed by His grace; find balance through the principles of this chapter. Amen.